The classes are divided into three separate groups — the younger group, the middle group and the older group. Classes are “family” groups of children ages 5 – 8, 8 – 11, and 11 – 14 with an average of 16 children per group. These groups overlap age-wise to allow maximum flexibility. The older students in a group are encouraged to help the newest arrivals with their work and projects. As the older students move into a higher group, they in turn become the newest members and are encouraged and helped by older members of that group. 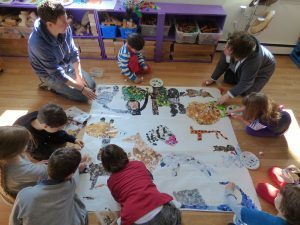 Group projects (which may be as small as two students working together or as large as the entire school) are frequent and provide many opportunities for multi-age interaction.